Weekend again shaping up nicely. G’day, Once again the weekend is shaping up nicely for you weekend warriors with overcast, windy, rainy conditions backed up with black nights at the moment. Currently I am staring out the window and watching the rain pour onto my deck with no sign of it looking like it will be easing for a while. This is the third weekend in a row which mother nature has turned on perfect conditions for anglers wanting a long weekend away trout fishing in Taupo. I must admit I have been really racking my brain this week and discussing the topic of where all the fish are going in the Tongariro when they pass that road bridge and why they are moving so quickly. Last weekend there were fish everywhere being caught from the town pools down to the lower river and everyone was carrying a couple of silver bullets and this continued on Monday while guiding a couple from Australia. Feeling very confident with guiding at the moment I grabbed another half day job with two German boys on Tuesday morning and found myself in the lower reaches waiting for it to become light enough to see an indicator, it was perfect. After explaining what we were going to do and how to do it the boys started casting and making some reasonable drifts which fooled 3 fish straight away two of which made it to the bank. Things were looking good but the good fishing I had found for so many days soon dried up and we were left with nothing for the rest of the session? I rang Mike which was on the river fine tuning some skills and he had been everywhere and was facing down the barrel of getting skunked after 5hours! Where do they all go? Are they there but decide not to feed or accept glo bugs like they had so readily for days on end before ? This is a tough one and at the end of the day we probably will never really know and will put it down to the grand old saying which we seem to use quite alot and “fishing is fishing”. 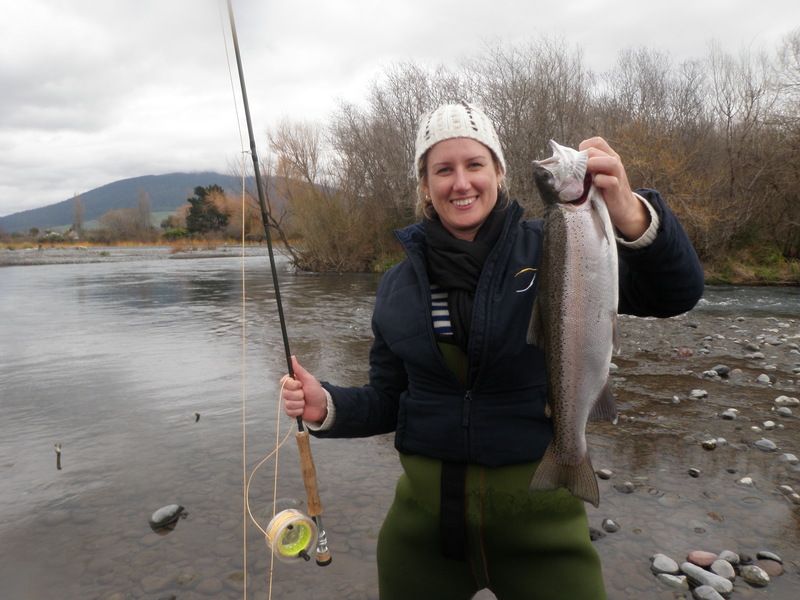 The Tongariro is currently in great condition and the weekend fisherman should see the water up a little bit which will be making for good fishing once again through the Braids, Plank pool and places like the Bain pool. If you are a reasonable fisherman and know how to read water the braids can be very productive in the winter months as many fish will hold in this area while pushing up to larger pools. If you are not so confident with reading feeding lies or bubble lines watch other anglers there are usually other guys about in this area and you can pick up alot of info by sitting back before flogging the water. The braided area changes with every flood and just when you have the area sorted it will change again and you willÂ need toÂ change how you fish it slightly to be successful. With cold wintry days upon us and overcast conditions just about all day sometimes glo bugs have been attatched to my rods just about most of the day while they have been working. Even when conditions are clear and sun is high they will still take a glo bug quite well at this time of year. Naturals will also be taken as well and using small white caddis, green caddis ,hare and coppers or pt variants will always ensure that those difficult fish can be caught. 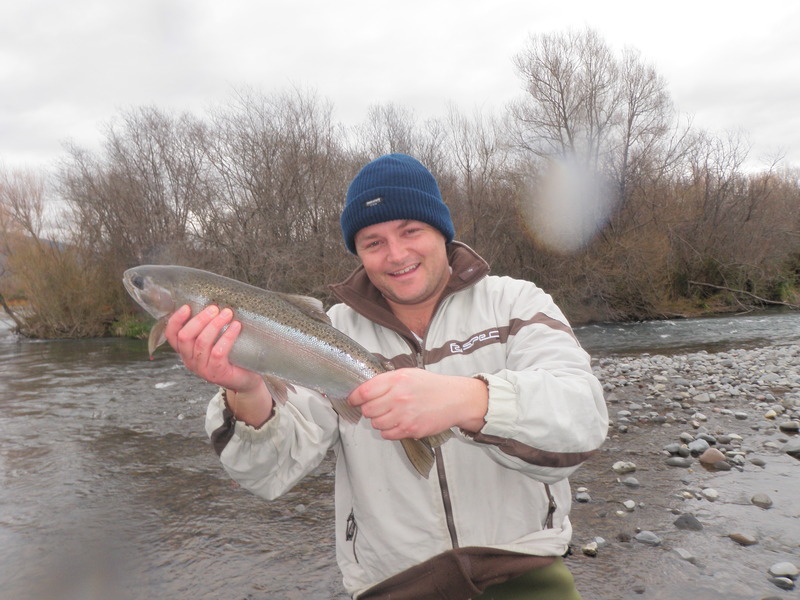 Most taupo rivers seem to be producing fish in some numbers and with the rain and wnd we have had the Waytahanuie should have a few more numbers in it this week, especially in the lower reaches. There’s a few reports going about that there are some double figure fish in the upper reaches so if you would like to have a look at one of these beasts get up and take a sneaky peak, catching them maybe another thing all together. River mouth shave fished quite well with the dark nights and guys are starting to get a few more minutes out of evening fish’s with it not getting dark till just after 6 now. 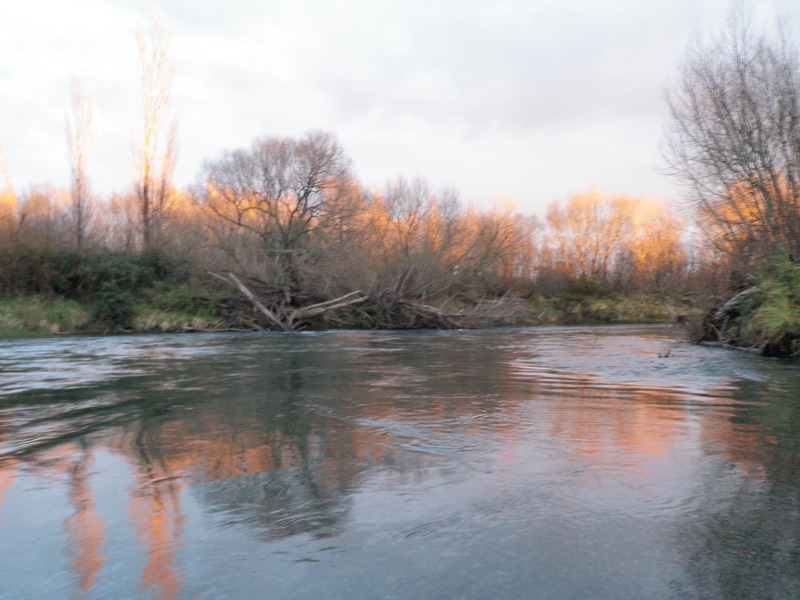 The Tauranga Taupo has had alot of fisherman but I’m still not hearing of any big fish days in here and am starting to wonder if this river will fire at all this winter, I’m sure it already has or will and I just have not heard someone would have had a good day in there. 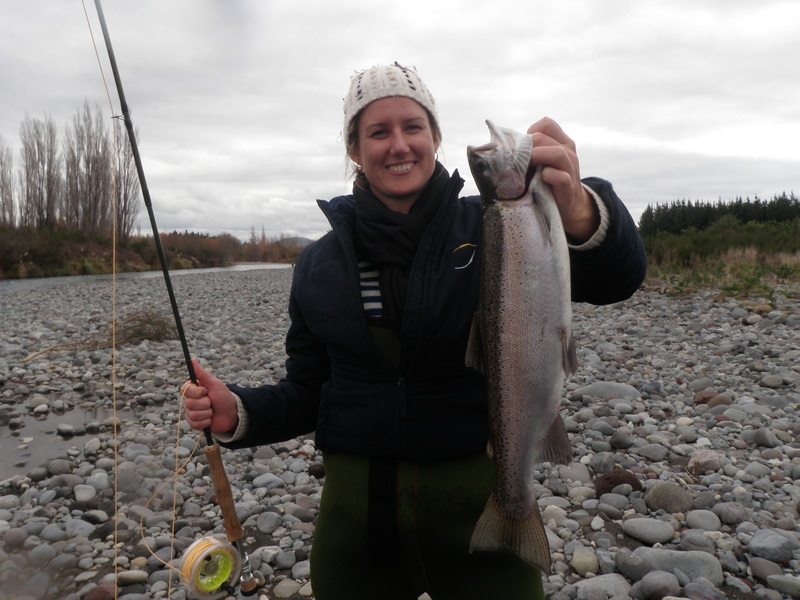 The Tongariro is still my favourite for options and fish numbers and should continue to be good fishing for months yet setting up good fishing going into summer. The later these fish do spawn the longer they will be encouraged to hang about in the upper reaches and take advantage of the food sourse before shooting back to the lake which will hopefully make for another good summer cicada season. Yesterday I was able to take a bit of time out and venture into the forest in search of a pig for the freezer as stocks on wild bacon were getting out numbered by smoked trout so with perfect conditions and no wind the dogs were loaded and knife sharpened. I have not been out for quite some time and I hoped the dogs remembered what the smell of a mob of pigs was like to ensure the few hours before night fall was prosperous. Just on dark the dogs got onto a scent and were off charging deeper into the pines through some lovely blackberry (great). 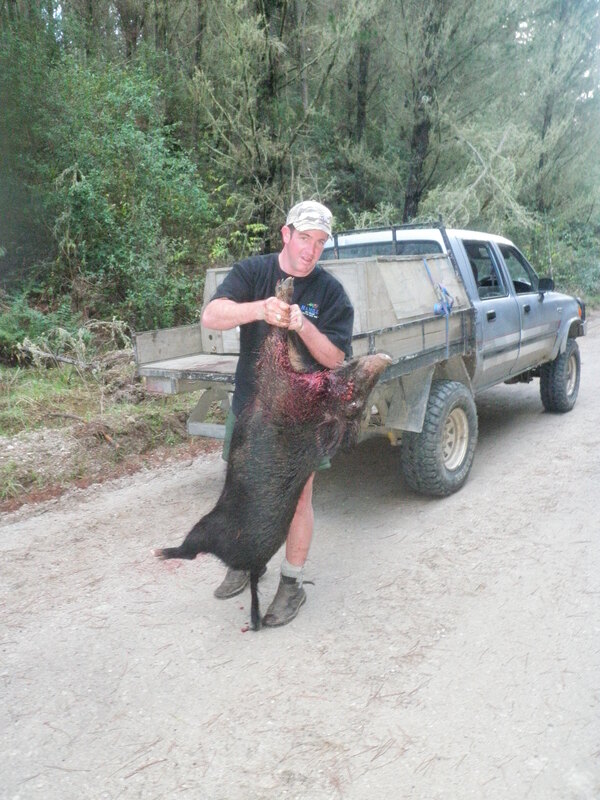 ith adrenalin pumping and the last chance of a pig I took of into the pines as I heard the lead dog hitÂ a pig and begin holding. It was not long and all dogs were involved and were waiting for me who was wearing shorts and tip toeing through blackberry Â to come and end things. The pack was holding well and it did not take long to makesure we had what we went in for. The rush of adrenalin when you know your dogs have hold of a pig is sort of like having a cicada chomping brown take your fly and chasing the bugger down a rapid hoping that the hook holds, of coarse not quite the same. Bacon butties for a while longer tho. Should be a good weekend to be in taupo people with all rivers in perfect condition to chase spawning rainbows.